In its highest order, meditation provides a comfort zone in the silence or emptiness, in the Void, a oneness with divinity, a state we call Samadhi. Meditation is the greatest adventure there is. In its truest sense, meditation is about realizing exactly how we create our lives, and by extension, who we truly are and what life is really all about. Here’s the thing: we are not our bodies. We have to accept that premise first. We know our bodies die, so we can’t be our bodies. We can feel that, if we consider it. Our bodies are just composites of karma, the memories that we carry from this life and previous ones. We are far greater than our bodies or our karma. We are divinity wearing a body, and the essential quality of divinity is light. When we look at a light bulb, or the sun, or an after image behind our eyes, we say to ourselves, “Oh, there’s light,” and then dismiss it. It is so commonplace that we gloss over the fact that everything we see with our physical eyes and mind’s eye is a play of light. 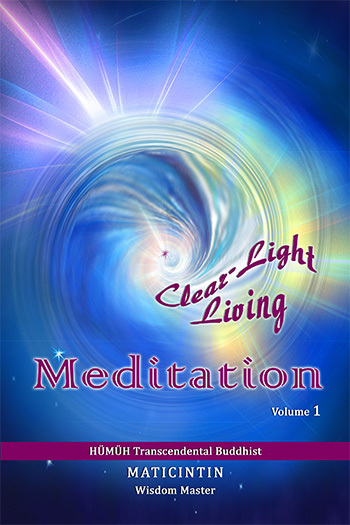 Clear-Light Living Meditation is a state of pure absorptive awareness in that light of consciousness. Anybody can access it, because that clear light is the true nature of all sentient life. We only need to discover how to access it. We begin to develop this ability through maintaining conscious awareness of both the inner and outer light at all times. The outer light we see with our eyes is simply a physical manifestation of that inner light of divinity. By doing this, we expand that divine light within ourselves. This is the first level of Clear-Light Living Meditation. Meditation is a living practice that we take into every aspect of our lives. When we put our attention on the light, it naturally quiets the mind and the body becomes more relaxed, which allows us greater focus, free from mental distractions. It is a present moment awareness, which means there is no split in our attention. We are aware of our environment and what is occurring in it. Therefore, we avoid unwanted circumstances because we see what needs to be done and do it. Once we start to become acquainted with the light and the experiences that result, we begin to see meditation as an adventure, and we treasure our meditation time. But this is just the tip of the iceberg. As we delve deeper into the light of awareness we discover the depth of meditation and come to realize, through our own experiences, that we are divinity wearing a body and that the purpose of life is to wake up to that fact. 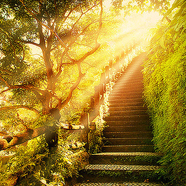 There are 10 Levels of Living Light Meditation, one building upon the next. Thus, each level must be mastered before the next level can open up. The fastest possible time is 100 consecutive days on each level, or a Journey of 1,000 Days. Here, the practitioner learns to see the light both all around them and with the eyes closed, or almost closed, or in the dark. They come to recognize the presence of light while moving around with eyes open and how light is constantly present in every thing, every action, every person, every image. They become adept at looking for and seeing the light throughout the day, noticing light and shadow, being aware of contrasts, noting the shine of light off objects and persons. At night, they fall asleep that way—looking at the light. The Observer’s life is revamped into a giving and receiving mode, whereby the practioner’s entire life viewpoint is corrected to a stance of giving without ulterior motive or hidden agendas, with no expectations or attachments. Thus, they act in service from the divine perspective of ‘for the good of the whole.’ It is from this life-stance that giving becomes receiving to eliminate worry and frustration, which are aspects of poverty consciousness. Once the practitioner is aware of the light and able to see it with eyes open and closed, they begin to develop a quiet mind. Now, because they can see the light with eyes closed, they discipline the mind to be quiet by observing what stimulates mental chatter, rather than obliviously engaging in the mental chatter or identifying with mental images. Sitting meditation then becomes a period of getting acquainted with the light, looking for the light, and shutting the door on mental chatter. The Detector reaches a point of realization about their spiritual practice—i.e. Wish-Fulfilling Gem Mantra, Clear-Light Living Meditation, the presence of the Three Jewels (The Teacher, The Teachings, and The Path), and the Seven Gates of HÜMÜH*, in conjunction with the development of a quiet mind, which thereby perfects the self-discipline in regard to these spiritual practices. *More information on the Wish-Fulfilling Gem Mantra, The Three Jewels, and the Seven Gates of HÜMÜH can be found in the book Secrets of the Golden Spiral. As the practitioner starts to master quieting the mind and become more acquainted with the light, they begin to notice a mottled, black and white screen on the inside of the eyelids, little dots of light and dark mixed together. This is called the mesh, a place where light reflects and mental imagery is born. Here, the practitioner develops the discipline to maintain their awareness of this mental screen. As they concentrate on the mesh, it gradually moves away from the inside of their eyelids and sinks deeper and deeper inside of them. Blotches of light begin to appear, but the practitioner just lets them come and go, gazing quietly at the mesh without expectations. Eventually, the light forms into pictures and scenes from the past that are displayed against the screen. The practitioner learns to observe the images without trying to direct them or getting caught up in the stories they present. The practitioner begins to explore the mesh with the awareness that comes from a quiet mind. At this level, the Dreamer and Visionary gains insight into the impermanent, transient nature of existence. They do this through observation and relationship with people, things and situations, and develop virtuous patience in enduring difficulties while assisting other sentient beings. This is accomplished through their own self-refinement, which has cut off the three roots of unwholesomeness: the roots of desire, hatred, and delusion. The attainment of this level is made possible through determination and satiety with worldly life and obsessiveness. 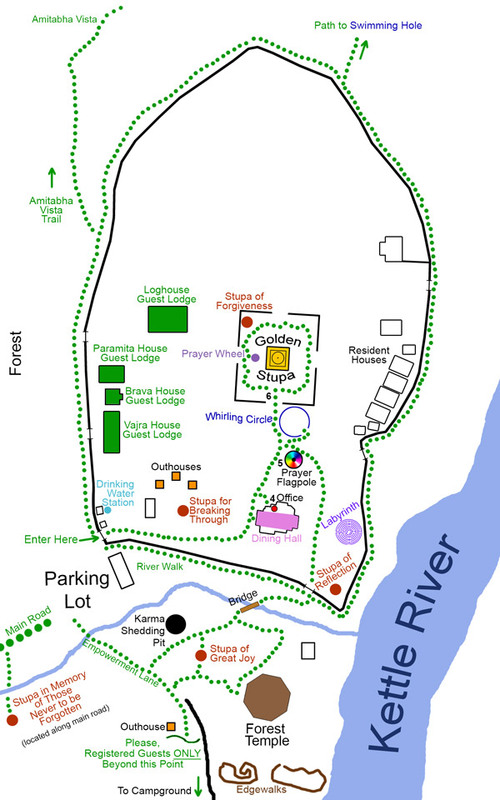 As a result, the Dreamer and Visionary acquires the five supernatural powers: 1) the ability to transmute energy; 2) to hear divinely (to discern the energy within sounds); 3) to perceive the thoughts and energies of other human beings; 4) to recollect some previous existences; and 5) to see with divine eyes, which means they contain knowledge of the impermanence of life and the consequential cycles of birth and death. In the final development of this stage, the practitioner attains the ability to always abide in the principles concordant with enlightenment by being able to make corrections that return the practitioner’s mind to its dispassionate center or to reclaim a state of equanimity. Eventually, once the practitioner has learned to observe the parade of imagery without mental chatter and to maintain their attention on the mesh, the mental screen will grow dark again. There will be an incredibly loud popping sound and a burst of yellow light, which appears to have shot out from the practitioner. This experience may happen once, twice or more, but afterwards the seal is broken, the channel is clear, and the practitoner is never the same again. Sitting meditation and post-meditation become inseparable, and every action and non-action is used to explore its never-ending depths. The radiance of the Self-Liberator’s state of consciousness blazes to purify their remaining false conceptions to make way for wisdom. They dedicate their attention to joyfully persevere to perfect the demands of enlightenment: being mindful of body, feelings, mind, and mental objects—in that order. These, in their most exacting state, form the roads to power, which is extracted from the inner silence. Such inner silence brings about concentration, or the basis for the activation of so-called magical power. Concentration here means over-all joyful perseverance within the Self-Liberator’s mental imagery that is both inquisitive and daring or bold. Such concentration or focus also provides an acute awareness of the sense organs, including the masculine and feminine potentialities that distinguish the genders; the vital faculty of mind that determines all physiological phenomena; the faculties of pleasure, pain, joy, sadness, and indifference; as well as the root of faith, and the faculty of perfect knowledge. In addition, they gradually acquire the ability to cultivate principles and methods that are concordant with enlightenment that will take them to the next level. As the practitioner begins to delve deeper into Clear-Light Living Meditation, they come to realize they must let go of mental constructs. 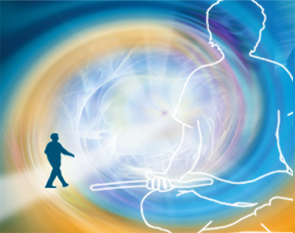 Thus, through a heightened body/mind/spirit connection, the practitioner uses Super-Cognizance* to dissolve the illusion of trivia and limitations, and instead, begin to create free from mental constructs. This level is called the Conquistador, a practitioner who conquers the unconquerable. At this stage, the Conquistador absorbs themself in meditation in order to achieve an intuitive grasp of the truth. Now, doubt and uncertainty of what is wanted has already been cleared away, and the Conquistador knows that through attainment of necessary wisdom, the correct way, as well as the incorrect way, will be recognized. The Conquistador has realized that they are at one with the whole, and gradually, they attain the ability to always abide in mental attention, and to see the signs of mental slippage from attention, which allows them entrance into the next level. Thus, as the practitioner continues to strive to live from Super-Cognizance, a basic knowledge appears and they are able to comprehend the illusion of time, realizing that time is merely a part of the planetary gravitational force (an open, pulling sensation from existence within environments) plus mental sensations. The practitioner also comes to realize that light and its fluctuations create motion, and that motion creates life and life forms. They also see that there are parallel energies playing counterpoint to each other to create harmonics that invent situations. This is a level where wisdom can be viewed. Here, the Manifestor recognizes that all primordial teachings are free from characteristics, forms, and dualities. As a result, they also attain insight into conditioned mental arising and transcends discriminating thought about the perfection of wisdom, and instead, comprehend nothingness. Before passing to the next level, the Manifestor develops the ability to continuously abide in mental attention without any sign of mental slippage. 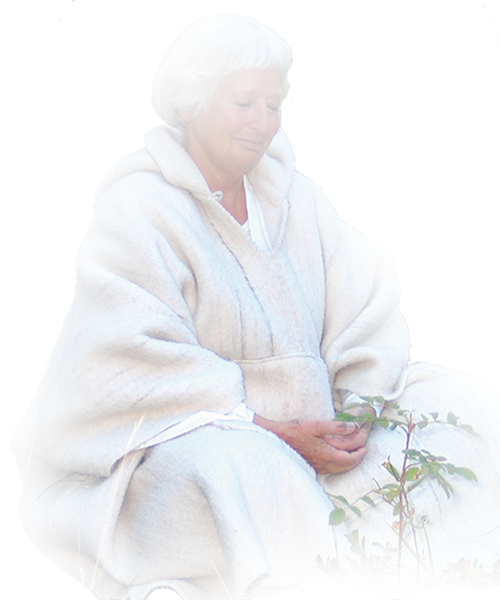 The practitioners’ absorption in the meditative experience has brought them to this point. But now, to take the next step, to realize the rootless essence of mind, the practitioners must cut their attachments to the meditative experience itself. All the rules of the first six levels drop away, the training wheels are removed. The Distant Thunder has attained Self-Realization, and can now see himself manifest in any conceivable form. After passing through this level, falling back into lower levels of existence is no longer possible. This level, therefore, marks the ‘irreversible way.’ Before the Distant Thunder can move on to the next level, however, he will have to attain mastery over signs by developing an overview of all life situations. The practitioner comes to realize that the act of observing affects the thing observed, and to interact with it, they must not try to avoid the opposing force. Therefore, at this stage, they must let go of their fears of being hurt by what is discovered as they continue to expand into the unknown. In this stage, the Immovable can no longer be disturbed by anything since they have received the prophecy of when and where Buddhahood will be attained. They gain the ability to transfer their merit to other beings and renounce the accumulation of further karmic treasures. Reasons, being based on premises, which by their nature are limiting and confining, disappear. The practitioner realizes that who they have identified themselves as, their personalities, do not exist. There are no individuals. There is only light. The wisdom is complete. The adept possesses the 10 powers of a perfectly enlightened being: 1) Knowing the possibilities of any situation; 2) Knowledge of the ripening of deeds; 3) Knowledge of the superior/inferior abilities of other beings; 4) Knowledge of tendencies; 5) Knowing how the world is formed; 6) Knowing the paths that lead to various realms of existence; 7) Knowing how purity and impurity come into being; 8) Knowledge of meditative states; 9) Knowledge of deaths and rebirths; 10) Knowledge of exhaustion of all impurities. In addition, the bodhisattva now also possesses the six supernatural powers: 1) Omnipresence; 2) Divine hearing; 3) Perception of thoughts of other beings; 4) Memory of past lives; 5) Knowledge of their own impurities. Also, there has been attained the insight into all rhythms of all mantras, and knows the nature of all primordial teachings and expounds them freely. 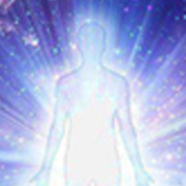 The dualistic ideas have been purged, and the non-dual has appeared in their place; purification has taken place. Super-Cognizance is complete. There is no distinction between dreams and the waking state. Perfect meditation is realized. The summit is now reached, all understanding and immeasurable virtue are realized. The transcendental body of the bodhisattva is fully developed. They are surrounded by countless bodhisattvas*, which confirms their enlightened status by all the enlightened beings of the Transcendental Consciousness; thus, perfect enlightenment is confirmed. *A bodhisattva is a dedicated practitioner who seeks to attain enlightenment for the upliftment of all sentient life, one who consciously acts for the benefit of others as an essential part of pursuing their own enlightenment. 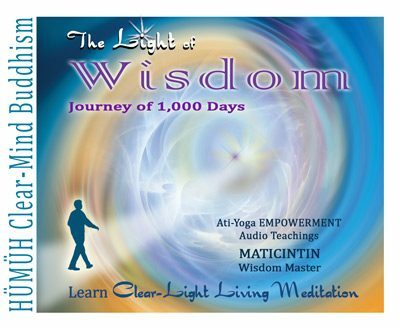 Whether you’re a long-time meditator, or a neophyte, Wisdom Master Maticintin’s Clear-Light Living Meditation invites you to discover the power of becoming a conscious creator through light infusion.